Comilla University observed its very first Comilla University Day-11 on May 28, 2011. The program of CoU-day was inaugurated by Dr. Amir Hossain Khan, Vice Canceller of Comilla University. A discussion programme was also held at the auditorium of CoU. In this session the Vice Chancellor, Treasurer, Registrar, Teachers, Office staff, gave their speech. A cultural event was arranged in the second part of the programme where artists from the Comilla University performed along with the renowned band Shironamhin. 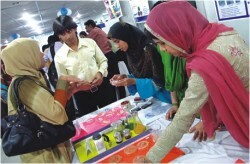 A Science Fair was organised by Pharmacy Club at East West University on May 23, 2011. It was titled as 'Pharmacy Science Fair 2011- Discovering New Ideas'. Professor Dr. Muniruddin Ahmed, Vice-Chancellor of East West University and Professor Dr. Choudhury Faiz Hossain, Dean, Faculty of Science and Engineering spoke in the programme. The programme was inaugurated by the Chief Guest, Dr. Jena D. Hamadani, Scientist, Clinical Sciences Division, ICDDR,B. Dr. Sufia Islam, Chairperson of Pharmacy Department gave an introductory speech. Dr. Jena Hamadani said a few words of encouragement addressing the students and said it was like a festival to her. Later, Abu Taiab Md. Jamaluddin, Senior Lecturer of Pharmacy Department declared the fair open. Dr. Jena Hamadani then visited every project and was delighted to learn about the new scientific information and research. The fair was an exhibition of new ideas and possibilities of science. Some of the topics that the projects portrayed were Probiotics, Antibacterial activity of Bitter Melon and Honey and several other interesting subject matters of pharmacy. The Orientation of undergraduate Programmes of Summer Semester-2011 of Southeast University (SEU) was held at University Seminar Hall. Orientation Programme for School of Business Studies, School of Science and Engineering, and School of Arts and Social Sciences was held where Mahbubul Alam Managing Director of Southeast Bank Limited, Prof. Dr. Nitai Chandra Sutradhar, Vice Chancellor of Bangladesh University of Textiles, Justice Md. Abdur Rouf, the former Chief Electrion Commissioner were present as chief guests. Prof. Dr. ANM Meshquat Uddin, renowned Educationist and Vice Chancellor (acting) of Southeast University chaired the programmes. Lt Col (Retd) Md. Ali Ambial Haque Khan, Registrar of SEU and Dr. Helal Uddin Ahmed, Dean (acting) School of Business Studies, Kazi Muhammad Tareque, Coordinator of BBA Program, School of Business Studies, Dr. R.I. Sharif, Dean, School of Science & Engineering, Prof. Md. Abdul Baten Miah, Dean (acting), School of Arts & Social Sciences, Professor. Sayed Fakhrul Hassan, Chairman of the department of Textile Engineering were present as well. Jatiyo Kobi Kazi Nazrul Islam University (JKKNIU) organized a three day programme marking the 112th birth anniversary of rebel poet Kazi Nazrul Islam. The Chairman of Bangladesh University Grants Commission Prof. Dr. A.K Azad Chowdhury inaugurated the celebration as chief guest on May 25 at university auditorium. Syndicate member advocate Reza Ali, MP and Vice-Chancellor of Bangladesh Agricultural University (BAU) Prof. Dr. M.A Sattar Mandal were the special guests. Treasurer of JKKNIU Prof. Dr. Md. Abul Bashar delivered the welcome speech. Around two papers on Nazrul were presented by Prof. Dr. Subrata Kumar Dey and Dr. Md. Emdadul Huda respectively. In addition, Prof. Dr. Syed Giasuddin Ahmed, Vice-Chancellor of JKKNIU chaired the inaugural session. The students of Music Department of the University performed dance sequences and took part in reciting some of Nazrul's poetry at Gahi Sammyar Gaan stage of the university. The students of Natyakala Department of JKKNIU staged a drama. Bangla Academy and Nazrul Institute organised a book fair at Theatre Hall of Arts Faculty. Three Masters Students of Department of Environmental Science of IUB submitted their final thesis on May 30, 2011 in a programme arranged at the University's permanent campus at Bashundhara. The research papers entitled “Application of Biomass for the Waste water treatment of a composite knit Industry”, “Coastal Flooding Impacts and Adaptation Strategies for Bangladesh, Case Study: Shatkhira”, and “Application of Bio-absorbents in removal of dyes from the Textile wastewater” were presented by Arif Reza, Saquib Ahmed Khan, and Umme Farzana. Prof M Ali Hossain, Head, Department of Environmental Science, Prof M Lutfar Rahman, Prof Jainul Abedin, Dr Abdul Khaleque, and environmental expert at CDMP, Ministry of Food and Disaster Management, GOB, Dr Tarik Bin Yousuf were present, among others, on the occasion. United International University (UIU) has been playing a significant role in building knowledge based society speakers told at the orientation programme of UIU, a two-day long programme held on May 25 and 26, 2011 for the newly admitted students of Summer 2011 Trimester at the UIU Auditorium. Newly admitted students in the School of Business and School of Science and Engineering participated in the colorful orientation programme. The first day UIU Vice Chancellor Professor Dr. M. Rezwan Khan, presided over the ceremonies and second day UIU Pro-Vice Chancellor Professor Dr. Chowdhury Mofizur Rahman, presided over the ceremonies while Dean, School of Business, Prof. Dr. Habibur Rahman, Coordinator-MBA Programme, Prof. Dr. M. Sadiqul Islam, Head of the CSE Dept. Prof. Dr. Hasan Sarwar, Registrar Prof. A.S.M.Salahuddin, Director of Students Affairs, Suman Ahmed spoke at the programme. The Heads of different departments, teachers, guardians, students and the invited guests were present at the programmes. Please take into consideration that from now on, Star Campus will be receiving mails at starcampus@thedailystar.net.